Halloween party drinks are just one more reason why Halloween can be so much fun (and so profitable) for bars who take part in the holiday. 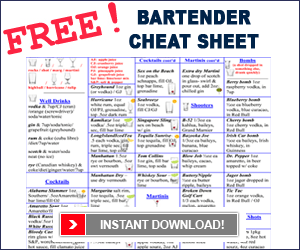 When I choose drinks to highlight, I try to stay with drink recipes that contain ingredients that you can typically find in most bars, pubs, clubs or restaurants. I try to stay away from the latest fad – some smokey infused cumquat flavored, triple distilled, upside down, double fruit blend of vodka. Sure, these are great for promotions in your bar and ya, you can make some cool cocktails with them. But, not every bar carries these products and they’re not available all around the world, so I like to keep it simple and stick with what most bars have on hand. That doesn’t mean the drinks are boring. Hells No! Below you’ll find one Halloween shot recipe and one Halloween cocktail recipe. Called a brain hemorrhage because of the effect the ingredients make when combined together. These are really cool looking shots – especially for Halloween – and they taste good too. Use a 2oz shot glass if you have one. Fill up your shot glass about 3/4 full with peach schnapps. Carefully add the Irish cream so that it floats on top. Don’t fill the glass to the top with Irish cream – leave a bit of room. Now pour in the grenadine to fill the glass. Experiment with how you pour in the grenadine as this is what gives you the effect of a brain hemorrhaging. This is one of those drinks that doesn’t really have anything to do with Halloween except for the name. There’s nothing gross, ghoulish, sick, twisted or scary about the drink itself. And the look of the cocktail doesn’t really lend itself that well to the name. However, Robert Englund – of Freddy Krueger fame – has partnered up with Hornitos Tequila to promote the drink. So there’s the SpOoKy part….so I’ve included it as one of this year’s Halloween drinks. 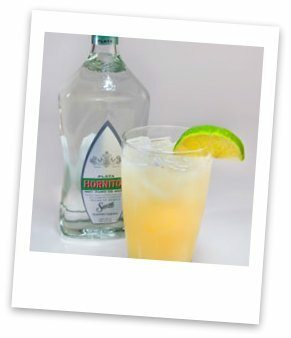 Fill up a shaker tin with ice and add the tequila, lime juice, pineapple juice and simple syrup. Then, using a grater, finely grate about 1/2 teaspoon of fresh ginger into the shaker tin. Shake with enthusiasm and then strain it onto fresh ice in a highball glass. Garnish with the lime wedge.